Many under-lifesize sculptures of fighting or dying barbarians in Rome are thought to be connected with the so-called Lesser Dedication, a group of bronze sculptures erected by either Attalos I or Attalos II, on the Acropolis of Athens. These lost sculptures represented mythological and historical battles with Giants, Amazons, Persians, and Gauls. The number of under-lifesize Roman sculptures representing barbarians defeated in combat is quite large and more than thirty are known so far. The drawings of the ten Little Barbarians published by Overbeck (1882: fig. 124). The labels in bold indicate the seven sculptures that were tested and are discussed her. Along with stylistic and historical considerations, the marble of the statues, unanimously identified as ‘Asiatic’, has been one of the key issues in the ample and still-unsettled debate on the dating and the geographic origin of the workshops that produced the marble copies. The term ‘Asiatic’, however, is ambiguous. Traditionally, it was used to group together several different marble varieties that are clearly not ‘Italian’ (Luna), nor ‘island’ (Cycladic and/or Thasian), nor ‘mainland Greek’ (Pentelicon and Hymettos) marbles. Reliable discrimination from similar fine-grained Asiatic marbles, such as Docimium, is possible primarily on the basis of the composition of the Göktepe marbles, which have unusually low concentrations of Mn and high concentrations of Sr and thus can be differentiated from all other fine-grained marbles known so far. 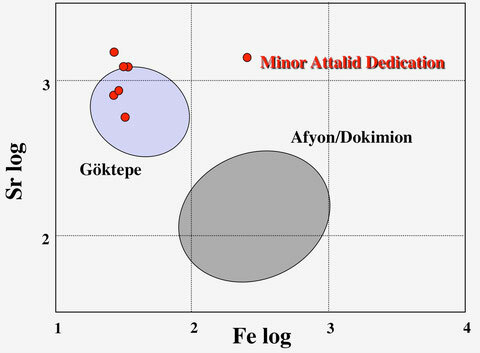 The high Sr and the low Fe and Mn contents allow a safe discrimination of the Göktepe marbles from all other fine-grained marbles used in antiquity. Present knowledge of the history of the quarries and the distribution of their marbles seems to rule out the possibility that the sculptures date from the late Republican period and supports the opinion, previously proposed on stylistic considerations, that they were manufactured in Rome by Aphrodisian sculptors probably during the first half of the second century AD. Attanasio, D., Bruno M., Prochaska, W,. and Yavuz, A.B., 2012: Aphrodisian Marble from the Göktepe Quarries: the Little Barbarians, Roman Copies from the Attalid Dedication in Athens. - Papers of the British School at Rome 80, 65–87.